Fitness and staying in shape is a large part of my life which is why I’m thrilled to have Adam Gilbert on the show today. Adam started the popular online fitness site MyBodyTutor.com where he provides personalized fitness training to clients over the Internet. What I like about his business in particular is that he has transformed an inherently unscalable industry into an extremely profitable business. And as you’ll soon see, he exudes passion for his coaching service. Like my other guests on the show, Adam is not a technical person yet he has managed to create an incredible business over the Internet. Enjoy! You are listening to the My Wife Quit Her Job Podcast, where I bring in successful boost strapped business owners to teach us what strategies are working and what strategies are not. Now this isn’t one of those podcasts where we bring on famous entrepreneurs simply to celebrate their success, instead I have them take us back to the beginning and delve deeply into the exact strategies they used early on to gain traction for their businesses. If you enjoy this podcast please leave me a review on iTunes and enter my podcast contest where I’m giving away free one on one business consultations every single month. For more information, go to www.mywifequitherjob.com/contest. And if you are interested in starting your own online business be sure to sign up for my free six day mini course where I show you how my wife and I managed to make over 100k in profit in our first year of business. Go to www.mywifequitherjob.com for more information. Now onto the show. Welcome to the My Wife Quit Her Job Podcast. We will teach you how to create a business that suites your lifestyle so you can spend more time with your family and focus on doing the things that you love. Here is your host Steve Chou. Steve: Welcome to the My Wife Quit Her Job Podcast. Today I’m really happy to have Adam Gilbert on the show with me today. Now Adam runs the site MyBodyTutor.com, where he provides fitness and wellness training, completely online. Now what’s really interesting about Adam’s business is that personal training has traditionally been in person type of activity. 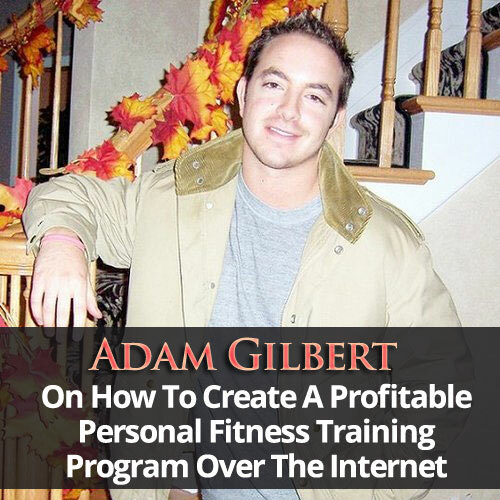 Like you go to the gym and you kind of hire someone to train you, but Adam has managed to create his business doing this completely virtually. Now not only that but I have three friends that are 100% vouch for his fitness program. Now the personal fitness niche is actually extremely competitive and saturated and traditionally it hasn’t really been scalable either. So I’m very happy to have Adam on the show today to talk about MyBodyTutor.com. So, welcome to the show Adam and congrats on your brand new child. Adam: Thank you very much, I appreciate it. Steve: Before you even tell us about your business, I’m just kind of curious how having a brand new child has kind of affected the way you run things so far. I know it’s only been a month. Adam: Yeah, first of all thank you again for having me, it’s awesome. Having a child has changed everything. I am very structured in my day. I have everything kind of planned and you know having my little Zachary has definitely changed everything. So I’m certainly getting used to it but it’s definitely a challenge. Steve: But it’s nice that you have your own business so things can be a little bit more flexible than if you had a regular day job, right? Adam: Absolutely and the wonderful thing is I get to spend time with him in the middle of the day. I get to hung out with him, I get to go for walks with him. It’s always a wonderful break for sure. Steve: That’s awesome men. So give us a brief overview about your business and how you make money exactly. Adam: Sure. My Body Tutor as you said is an online service. And really you know what separates us from the billion and one other companies out there, you know weight loss companies, wellness companies, whatever, is that we provide daily and personal accountability right. So when a client signs up, we match them with their very own body tutor and that tutor will give them a customized plan to help them reach their goals. And then really again what separates us is that not only do we have that phone call and say, Hey good luck let’s touch base in two or three weeks.” It’s, “Hey now it’s been communication every single day, right?” The fact that we are in communication with our clients every single day, giving daily accountability, daily support, and really system to monitor and track their progress is key. And you know it’s because we are in communication with our clients every single day, our clients gets the results they do. Steve: That’s kind of different than a personal trainer which you might only see maybe once or twice a week, right. So what you are saying is your clients actually touch base with you every single day right? Adam: Yeah. We have our very own website, our very own back end system. It’s really easy to use. They enter what they ate throughout the day or at the end of the day their choice. They can upload a photo of their meals they want as well and then they tell us what they did for the exercise. And again this is all a diet plan, an exercise plan that we spoke about with them right so we are on the same exact pages on that. And then they submit their report at the end of the day. And then the very next day their very own body tutor is writing back with expert routine, suggestions, feedbacks and encouragements to make sure they are staying on track and being consistent. And of course you know when they are having an inevitable, tactful challenge or mental roadblock, we are right there with them and that’s the key because it’s so easy to kind of rationalize and justify poor choices because we are in communication with them every day we can really get them right back on track quickly. Steve: One thing, I’m just speaking from my own personal just the way I am. Sometimes I’m kind of too lazy to enter stuff in online. So, is there something that you guys do to make me accountable for everything that’s been specified in the program? Adam: Yeah, I mean so definitely centers around you entering your food into the system. We made it really, really easy to use. I mean, entering your food and exercise really doesn’t take more than four to five minutes. And we work with some extremely busy entrepreneurs, people who are running very large businesses and are extremely busy. And just very busy people in general and I think the best part is they wind up enjoying it. They really look forward to it and they also look forward to getting the feedback every day. Steve: Okay, so if I’m entering my food then what does that get me exactly? Adam: So you are entering in your food at the end of the day or throughout the day, but at the end of the day you submit your report. That just kind of lets your tutor know what you ate that day, what you did for exercise that day, if it wasn’t exercise day. And then the real bread and butter of the program so to speak is that the very next day, your body tutor is going to be writing back with routines and suggestions and encouragements. Adam: With that you are kind of owning to what you ate, what you did for exercise is key because we are really holding you accountable on a daily basis. We are giving you daily accountability. Steve: As you said it is the food that I enter is kind of get converted into calories and that sort of thing. For me at least just human nature I might lie if I had like this triple fat Sunday or something. So, I was just curious how you guys kind of very gently, in a very non-confrontational way give critic and feedback for someone’s program. Adam: Right. Well I think that is where the art coaching comes in right. It’s definitely not shame based feedback. Shame based feedback is not going to help anyone change their behaviors and habits. I think we do have the advantage that if someone signs up for MBT they are clearly you know want to make their health and fitness a priority, they want to change. And you know lying to themselves and us is only a waste of their time. Steve: Right, okay, that completely makes sense. And I imagine the way you are priced actually kind of weeds out the people that aren’t going to be serious about the program? Adam: Sure. I think you know the price, I mean the reason why we charge what we do is just simply because we are giving so much attention to our clients. We are in communication with them every single day giving them real human feedback. It’s not cookie kind of feedback or a computer. Obviously it’s a real person sitting there writing them feedback, personalized feedback on everything they ate and everything they did for exercise. Steve: Okay, I see. One thing that I want to know also that I was kind of curious about is, let’s say I wanted to get in shape, so what is my incentive to sign up for someone virtually versus a real life human person that I can actually see, touch and yell at me? Adam: Right. That’s a great question. Personal trainers are great. I’m all for personal trainers. But I think the difference between a personal trainer and us is you know personal training you might see two or three times a week and that’s it. The real result mean– a lot of people don’t realize this but its 70% to 80 % of our results comes from what, why and how we eat our diet. On the trainer you always see those two or three times a week but the key thing is, it’s what you do between gym sessions. That’s why you see so many people working out with the trainer month after month and not looking any different because again what they are doing between gym sessions is entirely wrong. Steve: I see, that’s completely makes sense actually. Yeah because I recently tried to get a six pack and I found that it was more about eating as opposed to exercising. Adam: Oh yeah, I mean I was definitely made in the kitchen, there is no question about it and you can out exercise a poor diet. Steve: Yeah, I was going to ask, do you actually give a meal plan as part of your program as well or? Adam: Yeah, absolutely we give a customized meal plan, a customized work out plan. This is what we talk about with our clients and their initial phone consultations. So we really make sure they have a game plan. But again the key thing is, it’s one thing to have a game plan but it’s another to actually implement it and stick with it on a day to day basis. And really, the key to getting the body you want, the key to losing weight, whatever is eating right, exercising and doing those few things consistently. And as we know it’s the consistency part is all, that’s really what we focus on helping our clients do is stick with the plan day to day. Steve: Okay, so a lot of it, it sounds like largely it’s not automated. You actually get a nice human person that’s really giving you actual advice. And that’s– it’s not like you are getting some cookie kind of advice so to say? Adam: Not even close not even close and going back to your question the difference between an online thing versus in person. Also trainer you can easily be spending 60 dollars a session, that’s 180 dollars a week if you go three times a week. It’s like what 720 dollars a month to see a trainer. And again that’s only a small part of the battle really. Then you have nutritionists who are of course great as well but the thing is if you are lucky you get to see the nutritionist maybe twice a month. Usually once a month in their office for like 20, 30 minutes and you can easily spend 300 dollars on a session. And again it’s– they give you a plan but there is no follow through. There is no– they give you a plan and they assume the compliance is the easy part but I have always been under the impression and the belief that in 2014 a lack of knowledge is not so much of a problem; it’s the lack of consistency and action. Steve: Okay, you know that goes with entrepreneurship as well. It actually goes hand in hand with personal fitness which is what I found out. So, let’s switch gear a little bit and let’s talk about the very beginning of your business. Take me back to the beginning. How did you actually get your early customers, like I mentioned before this is a really competitive niche? Adam: Yeah, it’s crazy, I mean you know first I was working at Ernst and Young, I quit that job. I was doing that out of college for two years, I quit that job in January 2007. Then I launched MBT in February 2007. And I really got my early customers actually on Facebook. So, I actually launched MBT as kind of a spring break company. Basically, the goal was to help people get ready for spring break just because when I went to school everyone was obsessive over looking good for spring break. And you know back then Facebook had– they had ads. Actually it was ads or I forgot what it was called but I don’t even know what it– that was fliers, Facebook fliers. When you went to the school, you would get more impressions, right and what I realized is if you go to the school you get more impressions. So, I had a few friends in different schools and they gave me their log in information and then I was able to like log in into their account, advertize at those specific schools and would get like double the amount of impressions. Steve: Okay, so this is back on Facebook was for priority just for the colleges? Steve: Okay. And so you could only advertize to colleges and the way you got more advertizing space is if you actually brought your stuff to a different college or something and so you got, you used someone else’s account in a different college and that’s how you kind of spread the word? Adam: Exactly. It just basically got more ads by using other people’s accounts. Steve: Right, okay. And did you have a website? Adam: I had a website. It was very, very basic. I mean if you go to the way back machine you can see it’s completely different from the way it is now. Back then it was really, I was really focused and you know I hated doing it but it was necessary. I was really focused on selling myself because we had no testimonials, we had no success stories, we weren’t featured in the press or anything. No one knew who we were; I mean I was just starting out. One of the things that I vividly remember doing, I had my hero screen name on the website. Back then people still actually used aim and I actually had it on the website. And I would actually sit there for hours having I am conversations with potential clients talking about the program. Literally I mean hours. I still, I vividly remember this and like, it was just like, “Listen, try my program and if you don’t like it, I will give you your money back.” I really believed in what I do, I know it works. That’s how I did it, just client after client, one conversation at a time. Steve: And so this website didn’t have anything special about it. It was just a static page or…? Adam: It was pretty much just a static page. I mean there was a few pages to it but there was, again there was no success stories, no testimonials, no press. We weren’t featured in anything. No one knew who we were. It was just me selling myself. Steve: And so Facebook got you the people to that web page where you would then chat with them through aim? Adam: They could sign up on the site but I also made my aim screen name very visible at the bottom just because I wanted to interact with potential clients and customers. And you know I even had like my facebook profile because ultimately like first of all the site looked awful, it was very amateurish. I made it myself and it was just really about establishing trust. And there was just so many fly and like companies in the fitness world and they are still are and I knew that and I was very aware of it. And just kind of– I guess I was just naive that I just felt that what I offered really worked. But I knew I had to work extra hard to gain people’s trust. Steve: So how did you gain their trust earlier on when you had nothing? I was just curious. What would you say to these people? Adam: I would say listen like, “Here is my facebook account.” Like you know I had a personal blog. So I was like listen I’ve been writing online for– since 2004, basically just to proving and showing them that I’m a real person. Like I’m not just some dude in some closet trying to rip people off. I even think I wrote on the website back then, “This isn’t a scam.” I just– I tried everything. I just wanted people to give me a shot. That was really ultimately the goal. Steve: So, you actually had a personal blog which kind of, which you had maintained for quite a while, is that right? Adam: Right and I actually had the link to the personal blog on my website. I had the personal blog link there so that they can read it and that helped. Because again you just want people to realize you are a real person. I mean, it’s online, it’s a scary place. And for me the biggest thing was offering a money back guarantee. So people could literally my program for a month, not feel or see any results and they can ask for their money back. And you know that was powerful. I mean it’s really just a testament to, I think this is the right thing I do but it’s also, I just know what we offer works. I really sincerely believe in what we offer works, and I still offer a guarantee because of that. Steve: So, today you actually have a subscription based model. What is it like that before when you first started as well? Like how did you kind of come up with the business model? Adam: Yes. When I first started it was actually like a six week program and that was it. We had two levels basically one with phone calls every day and one without which we still have to this day. But it was just the six week program and that was it. And what happened is, after a few weeks many of the clients would say like, “Listen I love this program, I want to keep going.” And you know kind of very quickly I realized that like it should be a subscription model because of instead of having to ask people sign up every six weeks again, these people are asking me just make it subscription. So, it was kind of a no brainer and just kind of listening to my clients on that. But then instead of a six week we made it a four week subscription and it’s been like that. I changed that in like May of 2007 and that was helpful certainly to do that. Steve: Okay, so now it’s purely subscription based? Steve: Okay. So, now you get this kind of early trickle of customers. How has the way you’ve actually attained customers changed over the years since the very beginning? Adam: It’s really funny. We live; I mean I always like to say in results we get referrals. I guess one of the biggest early mistakes I made actually, I started MBT in February 2007 and by like April 2007 we had so many clients that I actually had to stop advertizing. And that was I think probably a big mistake just because back then it was working. If something is working keep doing it and I just couldn’t handle the growth. I wanted to hire other tutors. I wanted to build that sophisticated system. I had this whole dream of sophisticated system where I can manage other tutors, where I can manage and see what they were writing to our clients. And I eventually did that in 2009, two years later. But that was kind of this whole like pipe dream of like, all right once I do this or when I do this then I will start advertizing. Then I will start focusing on growth and kind of, I quickly realized that I’ve always been obsessed with quality and while growth is– growth is just a byproduct of getting people results. It’s really never been a focus. It really hasn’t. There are so many things we can be doing to grow more and more, we just really focus on our current clients. Make sure they get their results and they are happy and thankfully they will refer us to their friends and family and that’s basically how we’ve grown. Steve: So, when you mentioned you stopped the advertizing, was that the Facebook advertizing? Steve: Okay. Have you tried any other forms of advertizing? I’m just curious. Adam: Yeah, I’ve tried Facebook advertizing. Again I was just curious as well. I tried that probably a year ago, couldn’t get that to work. I tried Google adwords couldn’t get that to work, spent a lot of money in that. One thing that we really do and I think it’s a huge driver of traffic is just write a blog. I write a blog. I love writing; that is a huge passion of mine. A lot of people come to our site because of that, and that’s definitely something that has helped a lot. Steve: So, do people find your blog just naturally through Google or it’s just- -? Adam: Yeah. That’s always, they’ll just you know– because one of the things we always do when clients sign up is we ask them how they found us, and more and more throughout the last few years especially people are finding us just on Google. That always is a very nice thing. Steve: So, you mentioned that you had this dream about this back end for your site and presumably you have something much more sophisticated today right? So, are you a technical guy at all? Adam: No, not at all. Steve: Okay, so can you walk me through like just designing this website when you had no technical knowledge at all. Adam: Sure. I mean the first site that I started with, I designed on like Yahoo, I think it was Yahoo Web Hosting. I had done it through there. And basically for me it was just a proof of concept. I really wanted to make sure it worked before I spent all this money on a designer and building up this whole back end application. And then once I realized we really had something, and the program really worked as well as I thought it would, then that’s when I started looking for someone to help me take the website to the next level. That was only after two years. So, I hired this firm in Colorado actually. Steve: How did you find them? Adam: How did I find them? I think a friend recommended them to me. I really liked it. They were going to do the whole back end design and they were going to do the front end design. It was a huge amount of products. I remember writing like a blog post on my personal website and saying like, “When it comes out to it if you truly believe in what you do like you’re money talks,” and it was like when I would cut this cheque to this firm like it was wow, it was scary. It was definitely scary but I did truly believe in what we were doing. Steve: So this is a fully customized website. It’s not developed on any sort of standard platform? Am I right? Steve: Okay. Wow okay so I’ve done this before and it’s kind of what I do for a living in terms of creating computer chips. It’s not a trivial task, so can you just walk me through the process of how somebody who is not technical, and probably hasn’t designed any complicated website in the past, can work with the firm and fully specify exactly what you want on a website. Adam: Yeah. So I had this very clear vision of how I wanted it to be. We had tons of conversations. I think I actually flew out to Colorado to meet with them. I drew it out on paper. I would like scan it to them so that they can see it, tons of wire frames, just really lots of alterations. Just a really kind of thrashing up front to really make sure they understood exactly what it is I was trying to achieve. And they did an amazing job. They really did. Steve: So, do you still have them on retainer for maintenance of your site? Presuming you still have to add features from time to time right? Adam: Right. So that was back in 2009 and one of my dreams is always to kind of build a team around me of people who believed in MBT so much that they actually signed up as clients. So the firm I worked with actually was really good. They actually went and really focusing on much even larger scale projects like multimillion dollar projects and I basically became too small of a client for them. That’s site kind of the application and site kind of stayed that way for a few years. And then this guy named John signed up as a client too great actually. And then he told me he was a software developer and we just started talking. And he actually wound up working for me for free for a year. He just really believed in what we were doing so much. Adam: Yeah, amazing guy. Had amazing results with the program too and then long story short he’s actually now the CTO and he wound up actually rebuilding the entire application from scratch himself. And the cool thing is we’ve added so many features. Like one thing I’ve always wanted to do, being able to do was like add photos of meals. So now a client can easily snap a photo of their meal, upload it to the site and done. And like, that’s something that we launched last year. Just so many little features now that whenever we think of them or whenever we know that will really add to the client experience we can add it. Steve: That’s a lot more convenient than having someone in house that does all the work? Steve: So, how many trainers do you have, at most? Adam: We are about like 15 now. My site I haven’t updated with trainers in a while. So, yeah I mean it’s cool. It’s nice when you are– you get people reading your site and they are like I love what you are about and they want to work for us and it’s awesome. It’s very cool. Steve: So, if someone, let’s say one of my listeners wanted to start some sort of training program not necessarily in fitness and what not. What would be the best advice for them if they wanted to do this? Would it be to start a website, a blog, just go round and just try to get some business in the beginning? How would you advice them to proceed? Adam: Yeah, I think in 2014 that’s a great question. I would definitely advice them to start offline. I think it’s always better to go where people are, and I think there is so much noise online now. We really get most of the client’s offline now really because we have a client base but there are other people who are not reading blogs necessarily or they are not up with all the latest and greatest websites or wherever. They are just referring people that they know in their lives. So if I had to start all over, I would definitely just start with your own personal facebook page. Ask you know say, “Hey who here wants to improve in this, you know experimenting with watching something?” And just get two or three people right and focus on those two to three people. Get amazing results for them right and if you really get amazing results for them– and it’s not about the money at all. Do for free. And then if that’s works then you can find two or three more people. And before you know it, if you have 10, 15 people that’s a nice little business. Steve: Okay and then so you wouldn’t even worry about the website or the blog at all until much later from what I’m getting from there? Adam: If I have to start all over in 2014, I would definitely just make sure you get customers first. That is the most important thing. And I think a website is just delaying the hard work or the most important part of getting customers. Steve: Okay and what about the various forms of advertizing, do you feel the same way? Adam: I personally, I’m not an internet marketing or internet advertizing expert. If you are then I guess that’s a huge advantage but unless you know you can make it work. Then again I would much rather deal with people I know rather than try and attract people who you’ve never met at all, and have no idea of who you are. Steve: Okay, fair enough. The nature of your business is– it’s not entirely scalable in the traditional sense right, because of the human interaction? So is there a plan for you to scale your business or you are just perfectly happy the way it is providing quality to all your customers and not really worrying about growth so much? Adam: Yeah, I mean that’s something I’ve wrestled with for a while. And ultimately coaching is not a scalable business and that’s why giving people daily and personal feedback every single day is not scalable whatsoever. It’s a very, very time and labor intensive business. And honestly I just absolutely love it, but if your goal is to build an enormous company then I recommend not starting a coaching business. For me it’s more about just a lifestyle business and just impacting our current clients, and I’m happy with that. My goal is not to build a business for 10 thousand or 15 thousand clients or anything like that. It’s really just to take care of our current clients. Certainly of course you want to help more people but that’s not– that’s really not like… For me, me and my team focus on obsessively how we can serve our current clients better. Steve: Yeah, and incidentally that’s the theme of the podcast, its lifestyle businesses. So, that’s why I kind of want to steer this conversation a little bit back. You just had your first kid and I want to hug a little bit more. So, how hands off are you in terms of the business right now and how has having your child and being wanting– I suppose you want to spend a little more time with your child. How has that kind of affected your business? Adam: Yeah, I will tell you it’s hard. I’m actually very hands on with my business. I mean this is definitely a calling. It’s my passion, it’s my life. I always kind of joked around my wife that said you know “My business, my body tutor is my first baby.” It really is and she doesn’t like when I say that. Really it’s like you know for me I love working on it. I love writing emails to my clients. I love interacting with my clients. That is what I love doing. So it’s really a challenge actually to kind of find time for it. Find time for my son. Find time for my wife. Find time for myself a little bit. It’s tricky, there is no question about it but thankfully I can work anywhere. I get to see my son and wife all day which is great if I wanted to. There is definitely time for it for sure. Steve: Okay, explain since a lot of this is just one on one interaction. Can you kind of explain how you find the trainers that you’ve hired and so that they all kind of have a consistent message about your company right, since it is so personal? Adam: Yeah, I was told that was going to be a really big challenge. Just because we are only as good as our tutors and our tutors have to care a lot and that’s for me the most important thing. Certainly knowledge is important all but our tutors are experts and know a lot but they really have to be passionate and in it for the right reason. Thankfully throughout the years we kind of get two to three emails a week of potential tutors reaching out to us. Adam: Yeah. And it’s always been a wonderful position to be in because I would rather not hire any tutors at all if they are not the right fit. But just again because our clients, our business is only as good as our tutors. They will write these emails, these wonderful emails and saying how this is what they would love to join, they would love to be a part of it and then we usually go from there. I will tell you something interesting and it’s kind of one of my hiring something a little test I do is. It’s amazing to me how many people will write me like page long emails, “I love what you are doing, blah, blah, blah” and it’s great and I really appreciate and I will just say, “Hey I’m really busy today, would you mind emailing me in a week, right?” And it is amazing to me how many of these people will like not email me in a week or forget to email me in a week, not email me like 10 days later or whatever. I will say, “Hey today or whatever day it is can you email me a week from today?” And they wouldn’t do it. And it’s like, if they can’t pass that simple test then I know they are not, that little thing I know they are not going to be a good fit for sure. Steve: Adam you are like, “Hey Steve can you contact me again in a week about this podcast interview?” Very interesting, okay how do you- – sorry go on. Adam: It really weeds out some people because I would like to say, one of the keys to our success, one of the reasons why we are able to help our clients so much is we have this what I call, “A gentle relentlessness,” right. We have to be relentless to an extent, but we also have to be gentle. A potential tutor wants to be a tutor so badly they should definitely be able to email us in a week, that’s no big deal. Steve: Okay and how do you incentivize your tutors? I don’t know because they are just working for someone else. How do you differentiate the experience working for you versus working for a gym and doing personal train there? Adam: Right. I think one of the benefits is that they can work from anywhere. They don’t have to be in a gym. Adam: So, that certainly helps a lot. And it’s also really making sure you get the right people. I guess one of the reasons why– this isn’t again my goal is not to have like a billion tutors, a billion clients. Adam: So I don’t want to, I’m very careful who we select as tutors. Then probably we will limit our growth and that’s okay. So just finding the right people and making sure they are in it for the right reasons. Certainly yes they need to get paid and they do get paid well but if they are in it for the money, just for the money then they are not going to be good fit. Steve: Okay, these are just all– the questions that I’m asking, these are all just kind of fears that I’ve had as I’ve been hiring and stuff and we’ve actually had a couple of doubts here and there with our businesses, and so I was just very curious to know how you kind of screen out your employees and that sort of things. Steve: Cool. So, what kind of inspired you to actually go out on your own and start this business? Were there any books that you recommend that you read that kind of inspired you? Adam: I have always kind of– in college I had a business. I mean what really inspired me was just the fact that my first day of concord procedures job, I had a stomachache and I just knew that was not for me. I wasn’t happy for those two years while I was there. So, that really was what inspired me; I just knew that, that’s not what I was meant to be doing. In college I had this business and like I have never felt so passion in my life. And I knew that existed in me. And then when I had this corporate job like I just felt like, I was like it just wasn’t me. And I had to get back to that, that’s what inspired me to really pursue my passion. Steve: And as someone who isn’t very technical and that sort of a thing, were there any sort of web services that you would recommend to actually find the people, to find the developers or services that kind of just helped your business out that you might recommend? Adam: I mean the technology now is so much better than it was seven years ago. You can easily, fairly easily start a blog now, work for a site. There are so many sites where you can just bid on finding people to do work for you. I mean that stuff didn’t really exist seven years ago. To be honest I don’t really do that now because I have a CTO that kind of handle all that stuff. But I know there are sites we can easily bid out work and it’s no big deal. I have friends that built out business for like only 100 dollars they got their entire website. Now they are like multi-million dollar businesses. Steve: Yeah, I know I was just trying to see if you would do it all over again, will things be different in terms of the website and everything as well but it sounds like you don’t handle that, and it will be more of a question for your CTO. Steve: No, that’s cool. So, what would you say is like your secret source? Like why did you succeed in this business, where a whole bunch of other personal trainers who have tried to do this in the past have failed? Adam: Yeah, you know that’s a good question. I think, I like to think it’s just because some people say I’m extremely persistent and honestly I’m really just so persistent because I really, really believe in what we offer. And I have been at this now for seven plus years. And it’s just you know like for I’ve been writing a blog for years now, right. There were times where people weren’t commenting on it at all. Actually we really didn’t have any comments, we were like, I wasn’t getting any interaction right. And like you know it’s just been interesting throughout the years like I post my blogs then slowly by slowly people start emailing me saying, “Hey this really, really resonated.” It’s just about, for me I’d be doing this whether we had clients or not, like I would be putting content out there about weight loss, about the psychology of weight loss. We got all the stuff we help our clients achieve no matter what, this is what I love doing. So I think the key is really, really picking something you actually love doing because then it really doesn’t matter if you succeed. Success is going to happen just because you are willing to put the work and because you love it. And I know this sounds chizzy and like cliché but for me it’s like I had no problem staying up until three, four in the morning working on my site or writing things because it was fun. I truly enjoyed it. Steve: You know what’s really funny about running this podcast is I ask this question a lot and I get different answers. Some people say you don’t really have to love what you are selling, what not; it’s all about the numbers. And then on the flip side here you are telling me that you just have to be so passionate about it, and so into it that you know it’s going to succeed in the end because you are so passionate about it? Adam: Right, I mean for me I couldn’t, I can never run a business, just for me personally. Yes those people will say, “Start something, be good at it and then you will end up loving it.” But for me it’s always been about, life is too short why not love what you do for a living if possible. And I just, I have to love what I do. I can’t just sell something just for the– you know for money to be the goal, it’s just not me. Steve: So, I noticed you mentioned a lot of your business is just word of mouth. So, is there anything special? And I notice a whole bunch of testimonials on your site as well. So, is there anything that you do in particular to actually encourage these testimonials or encourage these people to submit their before and after results to you? Adam: Yeah, it’s really funny, I mean it sounds, it’s like I actually just started with less fears like asking people for before pictures and after pictures. The one challenge with the weight loss business, I mean we really have like thousands of success stories but a lot of people don’t want their pictures online. So, we ask people, a lot of people say, “Hey enjoy them but I would rather you not post them” so of course we don’t. But, it’s something I probably should have done from the very beginning is being more aggressive in asking people for before and after pictures, and you know testimonials and things like that. A lot of people just want to share, give us a testimonial but it’s something we definitely been more aware of last year is asking people for. Steve: Okay. Cool, hey Adam I don’t want to take up too much more of your time. We’ve been talking for quite a while. If anyone wants to get a hold of you or ask you any question about MBT, how can they reach you? Adam: Best way is just email me adam@MyBodyTutor.com and I will be more than happy to help you out in any way I can. Steve: Okay and in order to sign up for your program actually, is there some sort of free consultation one on one or do you sign up first and then you get the call or how does it work exactly? Adam: Yeah you sign up and then we will have the initial phone consultations. Of course if you have any questions or anything comes to mind about my program certainly email me, we will talk and certainly you want people to feel comfortable before they join. And I would love to– I think one of the cool things and I think we talked about this a little earlier is just, the cool thing about fitness is it really helps you to do everything better right? And whatever you do is worthwhile investment of your time. Steve: Oh, absolutely. I have lost like 35 pounds in like the last six months, and I feel a lot more alert since I’ve changed my diet. So, yeah, I can totally vouch for that. Steve: All right hey, well thanks a lot Adam. It was a pleasure having you on the show. Adam: Awesome. Steve thanks so much for the opportunity, I really appreciate it. Steve: All right men. Take care. Steve: Here is what I like about Adam. He’s taken an industry that is inherently unscalable and he’s turned it into an extremely profitable business that pretty much transcends geographical boundaries. Now he can literally train anyone across the world. And just that aspect of his business, I think it’s just really cool. For more information about this episode, go to mywifequitherjob.com/episode18. And if you enjoyed listening to this podcast, please go to iTunes and leave me a review. When you write me a review, it not only make me feel proud but it also keeps this podcast up in the ranks so other people can use this information, find the show more easily and get awesome business advice from my guests. It’s also the best way to support the show and please tell your friends because the greatest compliment you can give me is to provide a referral to someone else either in person or to share it on the web. And as an added incentive, I’m also giving away free business consultations to one lucky winner every single month. For more information about this contest, go to mywifequitherjob.com/contest. And if you are interested in starting your own online business, be sure to sign up for my free six day mini course, where I will show you how my wife and I managed to make over 100k in profit in our first year of business. Go to www.mywifequitherjob.com for more information and thanks for listening. Thanks for listening to the My Wife Quit Her Job Podcast, where we are giving the courage people need to start their own online business. For more information, visit Steve’s blog at www.mywifequitherjob.com. Thank you again Noa. Your article really made all the difference!